This week we examine how to decode the navigational, operational and stylistics of digital spaces. This includes decisional factors that are embedded into digital texts and media that illuminate inherent biases and understanding. Characteristics and conventions within modes of digital text will be examined. Norms and practices in digital environments will be explored e.g. safety, behaviours, privacy, sharing. 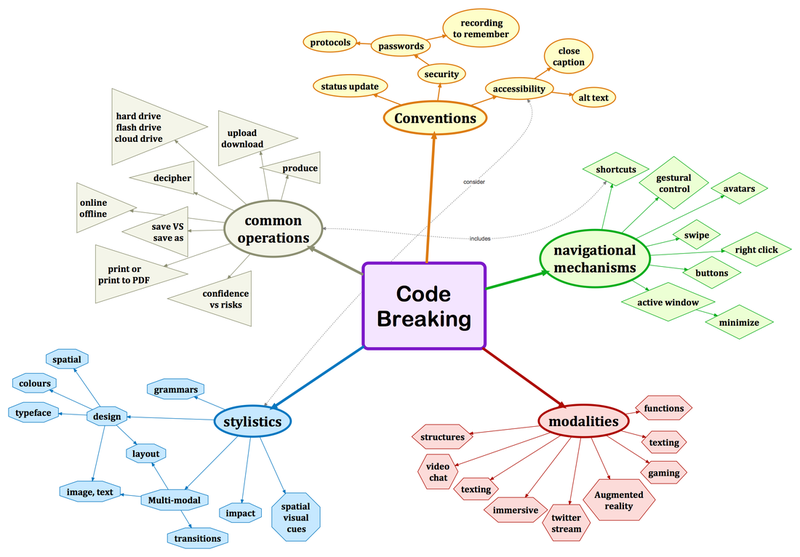 Code breaking focuses on how digital spaces are accessed, used, understood and created for a variety of user populations. What affordances are 'baked into' the tools to ensure the user experience is positive and productive? What assumptions are made by the creator and/or the user in order to access and understand how to move within the digital space? Explore and play with Mindomo in preparation for your use of this digital tool for the next part of your Inquiry Project. USE THIS LINK to learn more about how to sign up for this Ministry Licensed software. Sign up for Mindomo as an educator - you have access to an account under Lakehead University. ​From your own experiences, where have you had success or faced challenges in 'breaking the code' in order to access, use, understand or create in digital spaces? ​How can you teach students to decode digital spaces effectively? How can you integrate digital literacies into teaching and learning about 'code breaking' when introducing or using web or electronic resources? Explore and begin to create a map of your inquiry project in Mindomo. SLACK: Take a closer look at SLACK as a professional collaboration space, take some time to code break in this digital tool. What code breaking skills and fluencies have you developed as you began using Slack? You can link to our collaborative 'tinkering space' in Mindomo here (see below). If this doesn't work, try this LINK to access. This space is open and password free this week, but will be closed after this week's collaborative activity is completed.